Ventilatory impairment is known to occur in patients with heart failure (HF). Alveolar volume (VA) is measured by the dilution of an inert gas during a single breath-hold maneuver. Such measurement is sensitive to ventilatory disturbances. We conducted a prospective, observational study to establish the prognostic value of VA in systolic HF. We studied 260 consecutive patients who were hospitalized for systolic HF. All patients were evaluated under stable clinical conditions, before hospital discharge. Lung function studies included spirometry and determination of the lung diffusing capacity for carbon monoxide (DLCO) by the single-breath method. We also measured the cardiothoracic ratio on frontal chest radiographs, and the circulating levels of N-terminal pro-hormone of B-type natriuretic peptide (NT-proBNP). The hazard ratio (HR) of death was estimated with Cox regression, and the percentiles of survival time with Laplace regression. For survival analysis, VA was categorized as < 80% (n = 135), or ≥ 80% of the predicted value (n = 125). Follow-up had a median duration of 2.7 years (interquartile range, 1.1 to 4.2 years). The crude mortality rate was 27% in the whole sample, 36% in patients with VA < 80%, and 16% in those with VA ≥ 80%. The HR of death was 2.3-fold higher in patients with VA < 80% than in those with VA ≥80% (p = 0.002). After adjusting for age, New York Heart Association class III-IV, cardiothoracic ratio >0.5, NT-proBNP, persistent atrial fibrillation, DLCO, COPD comorbidity, use of beta-blockers and angiotensin converting enzyme inhibitors, the HR decreased to 1.9 but remained statistically significant (p = 0.039). Two percent of the patients with VA < 80% died about 0.9 years earlier than those with VA ≥ 80% (p = 0.033). 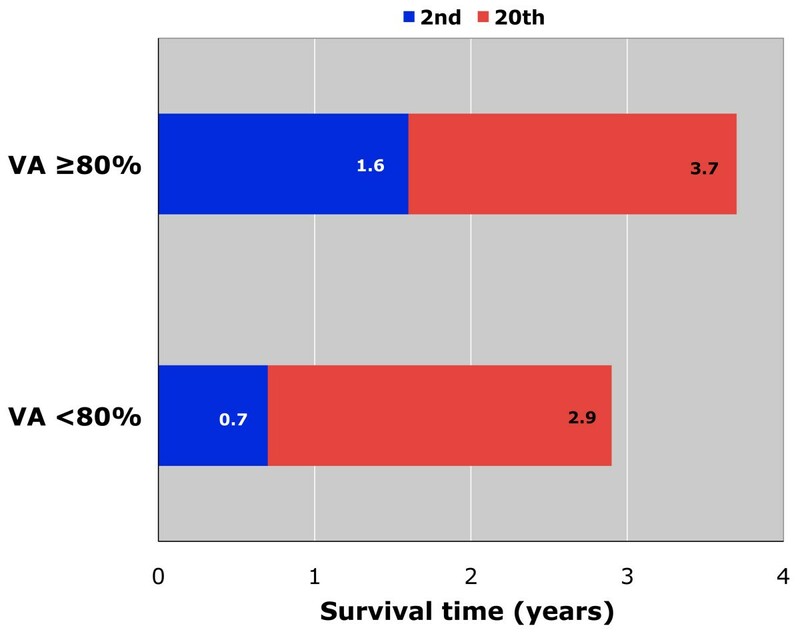 The difference in survival time at the 20th percentile was 0.8 years. VA is a significant, independent predictor of reduced survival in patients with systolic HF. Heart failure (HF) is a common clinical disorder carrying significant morbidity and mortality [1, 2]. Ventilatory impairment is known to occur in patients with HF, and is ascribed to factors such as heart enlargement, pulmonary stiffness due to chronic interstitial edema, and respiratory muscle dysfunction [3–7]. The coexistence of chronic airflow obstruction may add to ventilatory dysfunction, and is believed to have a negative prognostic impact in patients with chronic HF . As of now, most of the studies on the prognostic impact of respiratory dysfunction in HF focused on simple spirometry [9–14], with only a few exploring the exchange of gases across the alveolar-capillary membrane [15, 16]. Alveolar volume (VA) is the volume of air in the lung available for gas exchange, and is currently measured by the dilution of an inert gas during a single breath-hold maneuver . Due to the single-breath approach, such measurement is sensitive to ventilatory disturbances. In healthy subjects, VA equals total lung capacity (TLC) measured by multiple-breath helium dilution. In subjects with ventilatory impairment, VA is often much lower than TLC because of the insufficient mixing of gas in alveolar spaces . We conducted a prospective, observational study aimed at establishing the prognostic value of VA, as % of the predicted value, in 260 consecutive patients with systolic HF. The outcome measure was all-cause mortality over a median follow-up time of about three years. The protocol was approved by the local ethics committee (Comitato Etico, Azienda Ospedaliero-Universitaria Pisana, Pisa, Italy). Before entering the study, the subjects provided an informed written consent. The study sample comprised 260 consecutive patients with an established diagnosis of systolic HF. They were hospitalized at the CNR Institute of Clinical Physiology and "G. Monasterio" Foundation, Pisa, Italy, between January 1, 2000 and December 31, 2007. The diagnosis of HF was based on the Framingham criteria , and the finding of a left ventricular ejection fraction (LVEF) < 50% at transthoracic echocardiography. Patients were excluded if they had active cancer, recent (within 6 months) acute coronary syndromes, or pulmonary arterial hypertension. All the patients were evaluated under stable clinical conditions, shortly before hospital discharge. Lung function studies included the measurement of slow (SVC) and forced vital capacity (FVC), forced expiratory volume in one second (FEV1), and total lung capacity (TLC). At least three spirometric measurements were obtained and the highest values were chosen. Spirometry was performed by experienced technologists in conformity with the ATS/ERS standards . The diagnosis of COPD was based on clinical and spirometric criteria (post-bronchodilator ratio of FEV1/SVC below the 5th percentile of predicted value) . The degree of airflow obstruction was categorized as mild, moderate, or severe if FEV1 was > 80%, between 80 and 50%, and < 50% of predicted, respectively. Ventilatory restriction was diagnosed if FEV1/SVC ratio was normal, and TLC below the 5th percentile of predicted . The diffusing capacity of the lung for carbon monoxide (DLCO) was determined using the single-breath method in conformity with ATS/ERS recommendations . VA was measured during the single-breath maneuver using helium as the inert gas . Postero-anterior and lateral digital chest radiographs were obtained in all the subjects at the time of lung function testing, and were examined by two of the authors (MM, SM) for the presence of heart, pulmonary, and pleural abnormalities. On the postero-anterior view, we also measured the cardiothoracic ratio. This was regarded as abnormal if > 0.5. We measured the circulating levels of hemoglobin, creatinine, and N-terminal pro-hormone of B-type natriuretic peptide (NT-proBNP). The latter was measured by an electrochemiluminescent sandwich immonoassay using Elecsys 2010 analyser (Roche Diagnostics, Germany) . Medications prescribed at the time of hospital discharge were also recorded. The 260 patients were followed up until death or March 31, 2009, whichever occurred first. All the subjects were seen periodically at the outpatient clinic of our institution. Whenever required, their family physicians were also contacted. The cause of death was established by reviewing medical records, autopsy findings, or death certificates. Differences between groups were assessed by Fisher’s exact test for the categorical variables, and by Mood’s median test for the continuous variables. Continuous variables in the text and in the tables are reported as median and interquartile range (IQR). The association between VA and survival was evaluated with two methods: Cox proportional hazard regression to estimate hazard ratio (HR) for the risk of death, and Laplace regression to estimate the percentiles of survival time . Survival percentiles may offer a comprehensive picture of the covariate effects on survival time while overcoming some of the known interpretational limitations of HR . The main exposure of interest was VA which was categorized as < 80% or ≥ 80% of the predicted value. Based on univariate analysis, the following potential confounders were considered: tertiles of age (≤ 61, 62-71, ≥ 72 years), New York Heart Association (NYHA) class III-IV, cardiothoracic ratio > 0.5, DLCO as % predicted (split in two categories by the median value in the sample), tertiles of NT-proBNP (≤ 787, 788-2058, ≥ 2059 pg/mL), persistent atrial fibrillation, COPD comorbidity, use of beta-blockers, and of angiotensin converting enzyme (ACE) inhibitors. The crude and adjusted percentiles, and the hazard ratios and associated 95% confidence intervals (CI) are reported. The proportionality of the hazard in the Cox regression was tested based on the Schoenfeld residuals for each model separately. Two-tailed p-values < 0.05 were considered statistically significant throughout. The statistical analysis was performed with Stata version 11 (StataCorp, College Station, TX). The baseline characteristics of the study sample are given in Table 1. Based on clinical and spirometric data, COPD was diagnosed in 65 (25%) of 260 cases; airflow obstruction was mild in 11 patients (17%), moderate in 41 (63%), and severe in 13 (20%). In the whole sample, the median value of VA was 79% of predicted (IQR, 70 to 88%). There was a highly significant, inverse correlation of VA with NT-proBNP (r = -0.21; p < 0.001) and cardiothoracic ratio (r = -0.39; p < 0.001), and a weaker borderline significant correlation with LVEF (r = +0.11; p = 0.054). IQR = interquartile range. BMI = body mass index. NYHA = New York Heart Association. LVEF = left ventricular ejection fraction. NT-proBNP = N-terminal pro-hormone of B type natriuretic peptide. FEV1 = forced expiratory volume in one second. DLCO = diffusing capacity of the lung for carbon monoxide. COPD = chronic obstructive pulmonary disease. ACE = angiotensing converting enzyme. Table 2 shows the characteristics of the study sample spit by VA category. As compared with patients having VA ≥ 80%, those with VA < 80% featured the following statistically significant differences: (a) older age; (b) higher prevalence of NYHA class III-IV, abnormal cardiothoracic ratio, persistent atrial fibrillation, COPD comorbidity, and ventilatory restriction; (c) lower FEV1 and DLCO; (d) higher levels of NT-proBNP. As regards medical treatment, significantly less patients with VA < 80% were prescribed beta-blockers and ACE-inhibitors, and significantly more were on oral anticoagulants than those with VA ≥ 80%. Data are numbers (%), or medians (interquartile range). For abbreviations see Table 1. Radiologic signs of interstitial lung edema were detected in 16% of the patients with VA < 80% and in 3% of those with VA ≥ 80% (p < 0.001). Similarly, small pleural effusions prevailed significantly in the lower VA category than in the other (24% vs 6%, p < 0.001), whereas no statistically significant difference was observed as regards the prevalence of radiologic signs of emphysema (11% vs 7%, p = 0.293). None of the sampled patients had evidence of overt lung fibrosis. Follow-up was completed in all the patients, and had a median duration of 2.7 years (IQR, 1.1 to 4.2 years). The crude mortality rate was 27% (69/260) in the whole sample, 36% (49/135) in patients with VA < 80%, and 16% (20/125) in those with VA ≥ 80%. The causes of death were: heart failure (n = 44), cancer (n = 9), respiratory failure (n = 5), sudden death (n = 4), liver failure (n = 2), sepsis (n = 2), multiple trauma (n = 2), and renal failure (n = 1). Figure 1 shows the estimated cumulative incidence of death which was significantly higher in patients with VA < 80% than in the others (p = 0.032). The mortality curves are adjusted for age, NYHA class III-IV, cardiothoracic ratio >0.5, NT-proBNP, persistent atrial fibrillation, DLCO as % predicted, and COPD comorbidity. Estimated cumulative mortality in the study sample split by alveolar volume (V A ) as % predicted: V A <80% (red step curve); V A ≥80% (blue step curve). Estimates are adjusted for age, NYHA class III-IV, cardiothoracic ratio >0.5, NT-proBNP, persistent atrial fibrillation, DLCO as % predicted, and COPD comorbidity. P-value by log-rank test = 0.032. Table 3 describes the regression estimates of the HR of death for the two categories of VA. The unadjusted HR of death in patients with VA < 80% was 2.3-fold higher than in those with VA ≥ 80% (p = 0.002). After adjusting for potential confounders, the HR of death decreased to 1.9 but remained statistically significant (p = 0.039). VA = alveolar volume (as % predicted). CI = confidence interval. Model 2: adjusted for age, NYHA class III-IV, NT-proBNP, cardiothoracic ratio >0.5, persistent atrial fibrillation, DLCO as % predicted, COPD comorbidity, use of beta-blockers and of ACE-inhibitors. Laplace regression estimates of the percentiles of survival by VA category are displayed in Figure 2. They are adjusted for age, NYHA class III-IV, cardiothoracic ratio > 0.5, NT-proBNP, persistent atrial fibrillation, DLCO as % predicted, and COPD comorbidity. Two percent of the patients with VA < 80% died about 0.9 years earlier than those with VA ≥ 80% (p = 0.033). The difference at the 20th percentile was 0.8 years. So, the frailest were the most affected individuals by reduced VA.
Laplace regression estimates of the 2nd and 20th percentile of survival time in the sample split by alveolar volume (V A ) as % predicted (<80% vs ≥80%). Estimates are adjusted for age, NYHA class III-IV, cardiothoracic ratio >0.5, NT-proBNP, persistent atrial fibrillation, DLCO as % predicted, and COPD comorbidity. The present study was designed to establish whether VA, as percent of the predicted value, is a prognostic indicator in systolic HF. Our results can be summarized thus: (a) the cumulative incidence of death is significantly higher in patients with VA < 80% predicted than in those with VA ≥ 80%; (b) the estimated HR of death is about two-fold greater among the patients in the lower VA category, and remains significantly higher after adjusting for relevant confounding variables; (c) as indicated by Laplace regression, reduced VA is strongly associated with early deaths. We found a significant, inverse correlation between VA and cardiothoracic ratio. This suggests that heart enlargement is a major determinant of reduced VA in chronic HF. Generalized stiffness of the lung parenchyma may also contribute to diminish VA. Such reduced lung distensibility is due to chronic interstitial edema, and pulmonary vascular remodeling that are known to occur in long-standing HF . We also observed that VA is significantly correlated with the circulating levels of NT-proBNP, an established prognostic biomarker of HF . After adjusting for NT-proBNP, the HR of death associated with reduced VA remains statistically significant so indicating that VA is an independent predictor of survival. A number of studies investigated on simple spirometry as a potential indicator of future cardiovascular events. In the setting of the Framingham Study, Kannel et al. observed that FVC is a significant, independent predictor of cardiovascular morbidity and mortality in allegedly healthy subjects . Later, Kannel et al. reported that FVC is a predictor of subsequent cardiac failure in individuals with coronary artery disease and left ventricular hypertrophy . In recent years, there has been increasing interest in evaluating the prognostic impact of COPD comorbidity in patients with chronic HF. Mascarenhas et al. conducted a retrospective study in 186 patients with systolic HF, and found no significant association between having COPD and all-cause mortality (HR 1.40, 95% CI 0.88 to 2.44). Only severe airflow obstruction (FEV1 < 50% of predicted value) appeared to be a predictor of reduced survival (HR 2.10, 95% CI 1.05 to 4.22) . In 527 patients with a clinical diagnosis of HF, Iversen et al. reported that FEV1 has independent prognostic value (HR 0.86 per 10% change with respect to the predicted value, p < 0.001) . By contrast, Macchia et al. 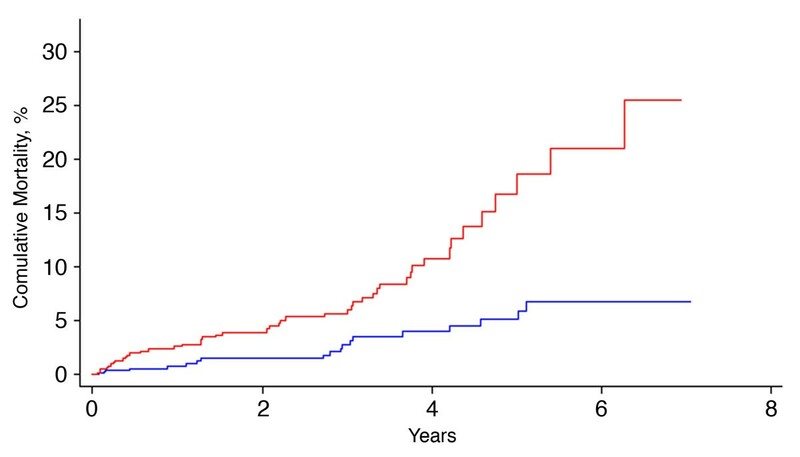 estimated an adjusted HR of death of 0.77 (95% CI, 0.37 to 1.58) in patients with systolic HF and concomitant chronic airway obstruction, suggesting that COPD has no significant bearing on survival . The three studies differ substantially for proportion of severe airflow obstruction, NYHA class III-IV, and duration of follow-up, and this may explain the inconsistent results obtained as regards the prognostic impact of COPD in HF. Recently, Miniati et al. reported that a reduction of FEV1 – be it due to airflow obstruction or ventilatory restriction – is a significant, independent predictor of reduced survival in 439 patients with systolic HF . In that study, the adjusted HR of death was 1.8-fold higher in patients with FEV1 <80% predicted as compared with those having FEV1 ≥80% . As of now, limited data is available on the prognostic relevance of lung function tests other than spirometry. It is well established that chronic HF brings about extensive remodeling of the pulmonary intra-alveolar vessels and interstitium , which may hamper the exchange of gases across the alveolar-capillary barrier . In 106 patients with systolic HF, Guazzi and coworkers reported that alveolar-capillary membrane conductance of less than 24.7 mL/min/mmHg is significantly and independently associated with a worse outcome . Partitioning of lung diffusing capacity into its membrane and capillary blood volume components requires the determination of DLCO at two different concentrations of oxygen in the inspired test bolus [15, 16]. This technique is seldom used in routine clinical practice. VA represents an estimate of the lung gas volume into which CO is distributed and, therefore, is critical in the measurement of DLCO with the single-breath approach . In the presence of uneven distribution of ventilation, due to altered lung distensibility or airflow obstruction, VA primarily reflects the volume of the airspaces into which the tracer gas rapidly equilibrates during the breath-hold time . The estimated volume can, therefore, be regarded as reflecting the size of the well-ventilated lung regions. As shown in Table 2, spirometrically determined ventilatory restriction, was present in only 53 (39%) of 135 patients with VA <80% predicted. So, we believe that measuring VA may add valuable information as regards lung function assessment in patients with systolic HF. Undoubtedly, factors other than VA affect the lung diffusing capacity, including the physical properties of the alveolar membrane, the density of alveolar capillaries, and the hemoglobin concentration . Thus, in multivariate analysis, we incorporated DLCO among the potential confounding variables. After adjustment, the HR of death associated with the lower VA category remained statistically significant. First, we only studied patients with systolic HF, so our findings may not apply to patients with isolated diastolic heart dysfunction. Second, our data originated from a single referral center, and included a relatively small number of cases. Broader multicenter prospective studies are needed to firmly establish the prognostic value of VA in HF. Third, we obtained a single determination of VA. So, it would of interest to evaluate the effect of cardiovascular and pulmonary medications on VA size over time, and to test whether improvement in VA is associated with a better oucome in patients with chronic HF. The present study indicates that VA, as percent of the predicted value, is a significant, independent predictor of reduced survival in patients with systolic HF. The authors wish to thank Concetta Prontera for the assay of NT-proBNP, Luca Serasini and Mirko Passera for preparing the artwork. Permission was obtained from those who are acknowledged. Study design (MM). Data collection (CP, ME, RP, IP). Data analysis (MM, SM, MB). Drafting the manuscript (MM). Approval of the final version of the manuscript (all authors).